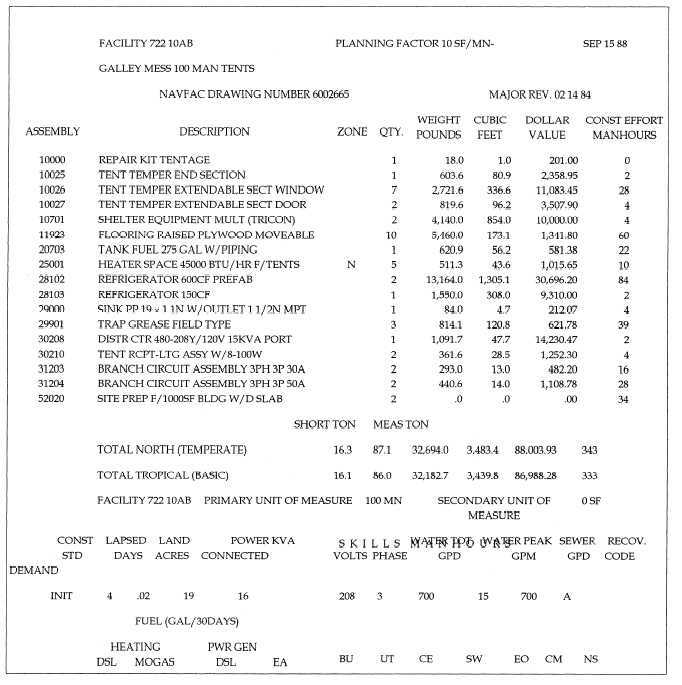 Figure 9-3.Facility listing for 100-man galley mess, ABFC facility 722-10AB. Home > Construction Training Manuals > Builder Advanced > Figure 9-3.Facility Listing For 100-Man Galley Mess, Abfc Facility 722-10Ab. Figure 9-3. - Facility listing for 100-man galley mess, ABFC facility 722-10AB. FACILITY. - Figure 9-3 shows a typical facility entry in part 2 of volume 2; for example, facility #722-10AB, the 100-man galley. Adjacent to the facility number, the heading shows the JCS planning factor applied (1 O SF/MN), which means 10 square feet per person. This planning factor is based on Planning Factors for Military Construction in Contingency Operations, Joint Staff Memorandum (MJCS) 235-86. The header also describes the basic capability of the facility. The NAVFAC drawing number follows the facility capability description. The drawing number is shown for reference purposes. All drawings in volume 1, part 2, are indexed by facility number.